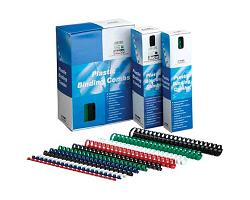 Quality Plastic Binding Combs fit any plastic comb binding machine. A4 size 21-Ring combs available in an array of colours and sizes from 6 mm to 51 mm for varying sheet capacity of bound documents. 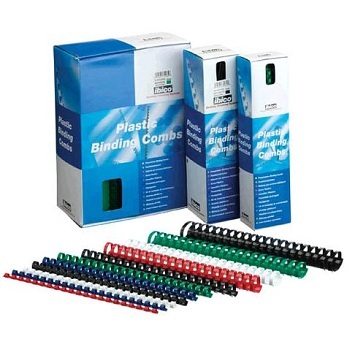 Strong, durable Plastic 21-Ring Binding Combs for A4 size reports. Suitable for all plastic comb binding machines. 6 mm width for 2-25 sheet capacity. Box of 100 plastic binding combs. 8 mm width for 21-41 sheet capacity. 10 mm width for 41-65 sheet capacity. 12 mm width for 56-90 sheet capacity. 14 mm width for 81-100 sheet capacity. 16 mm width for 101-145 sheet capacity. 19 mm width for 121-180 sheet capacity. 25 mm width for 151-240 sheet capacity. Box of 50 plastic binding combs. 32 mm width for 210-280 sheet capacity. 38 mm width for 281-375 sheet capacity. 51 mm width for 400-500 sheet capacity.